As you might know I'm a huge supporter of my fellow artists. I love surrounding myself with art that inspires me and I'm always looking for new products to add to our collections. Over the years I've been quite a fan of Redbubble products. 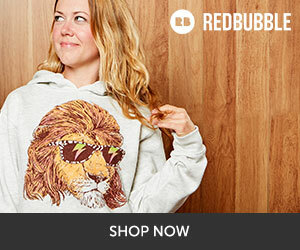 If you don't know much about Redbubble it's a marketplace for creatives to add their work to products like prints, clothing and home goods. I have quite a few of their products and love the quality of them. I do have to admit, it can be quite overwhelming searching through products and finding artists you like unless you have direct links from those artist to their shop. Lucky for you I love hunting through products. I thought I would share some recent patterns I love that you can get on a variety of clothing and products. I hope you find something new you might love as well! I plan to start doing these posts more often so if you have some artist you love or you are an artist with a Redbubble shop, please leave me a comment with a link! View more products from the artist here. I found a lot of products I wanted to share so I'll have a new post up soon! Have a great week!